The 34 string Dusty Strings Boulevard harp has gut strings with concert spacing and tension, perfect for a harp student who plans to transition to a pedal harp eventually. 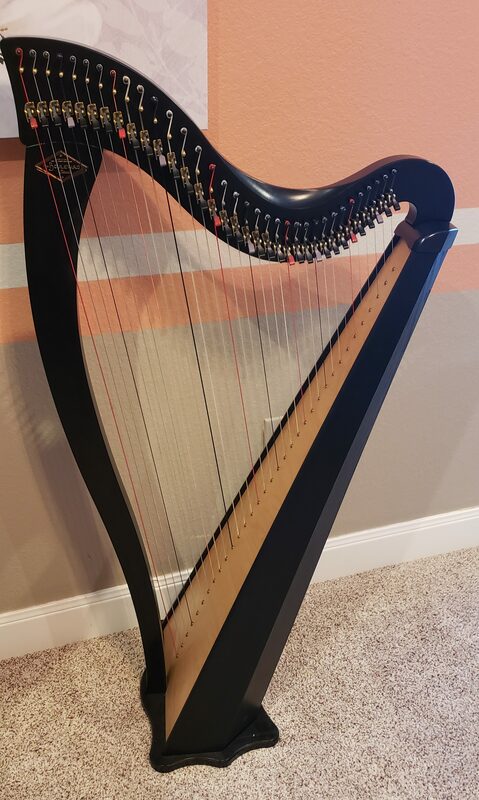 This harp is owned by the Gulf Coast Harpers Association and is managed by their group president Elizabeth Webb. Rent is $70/month (minimum 3 months) with a refundable $100 security deposit. Renter must carry insurance on the harp (you can add to an existing homeowners or renters policy, or get a policy through Anderson Insurance for around $150/year). Renter must be an active student of a local harp teacher. If renter stops taking lessons, the harp must be returned within 30 days. Contact Elizabeth for more information.